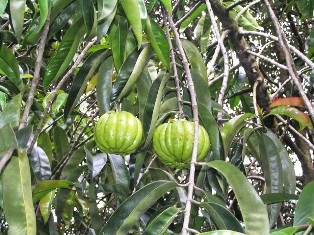 Asam Gelugor is a big-sized perennial fruit tree, which is endemic to Peninsular Malaysia. But it grows in a large part of South East Asia. This fruit also grows in North East India. 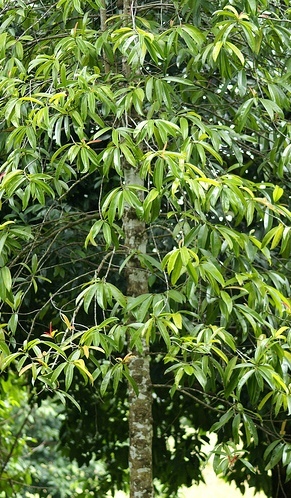 A tree, up to 20 m tall with drooping twigs and leaves; bark smooth, pale grey, latex colourless. Leaves narrowly oblong, up to 20(-30) cm x 6(-7.5) cm, dark green (bright red when young), glossy, fleshy-leathery, edges upturned, underside with prominent midrib and hardly visible thin, dark, wavy vein lets, petiole up to 2.5 cm long. Male flowers several together on twig ends; female flowers solitary, 4-5 cm wide; sepals 4, thick, green, persistent; petals 4, fleshy, dark red, persistent; stigma red. Fruits globose, 7-10 cm diameter, 12-16-grooved from top to bottom; fruit stalk 3-4 cm long; skin smooth, thin, bright orange-yellow. Seeds 0-several, flattened, up to 1.5 cm long, surrounded by bright orange pulp (aril lode). 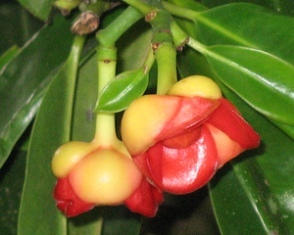 This tree usually bears female flowers only, male flows being uncommon. The ripe fruits are sliced, dried and used in curries or stewed in plenty of sugar and eaten. In Malaya, the rinds of under ripe fruits is cut into pieces and dried in the sun. 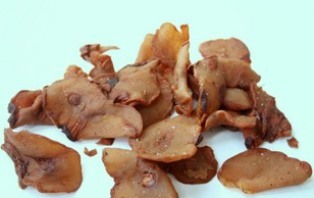 These are then sold in bazaars for use as a sour relish for use in curries in place of tamarind and for dressing fish. 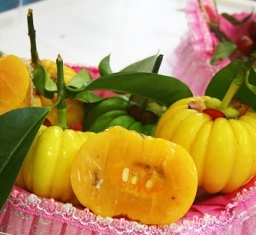 The fruit is also used in Thai medicine for reducing weight and excess fat. In fact the demand for this fruit is growing because of this. Dried fruits are also used as a fixative with alum in dyeing silk.